Like many people, I started playing sports at a young age. I loved being active and trying new things and ultimately spent most of my time doing gymnastics and basketball. When I moved to Tucson to go to U of A, I lost my motivation to work out. I tried going to the Campus Rec, buying a membership at a globo gym, and joining intramural sports but nothing stuck. In the summer of 2017, my good friends introduced me to CrossFit. 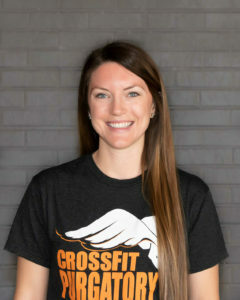 I started coming to CrossFit Purgatory that August and fell in love with the sport during my first WOD. What I love about CrossFit is that it’s an individual sport that we do communally. All I had to focus on was being the best version of myself during each workout and I could count on my friends and coaches to cheer me on. When the chance to become an intern, and eventually a coach, presented itself, I jumped at the opportunity. I wanted to give back to a sport that had already given me so much. My goal is for each athlete at CrossFit Purgatory to become the best versions of themselves. I believe in CrossFit’s methodology of constantly varied functional movements done at a high intensity. I believe in the community that CrossFit provides and believe that anyone in any stage of life can be part. It’s an honor to instruct athletes, to cheer them on, and to believe in them when they don’t believe in themselves. If you are looking for a chance, come join us! We would love to have you be part of our community!